I'm Dmitry. I purchased my bike in the end of March! 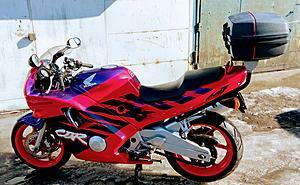 Honda CBR 600 F2, 1993 My bike was brought from Netherlands with original mileage 25890 km in very good condition邏! If you need anything in St.Petersburg city, you are welcome! Welcome to the forum Stepov and very nice looking ride. Welcome.. best of luck with it... it looks real clean..I love the euro paint on the F2s .. I wish honda sent a few of those schemes to the states back then..